You’ll see your dog’s delight when they discover a meaty middle with tuna, chicken and salmon. Shredded proteins and rich gravy are surrounded by delicious pâté with kale. 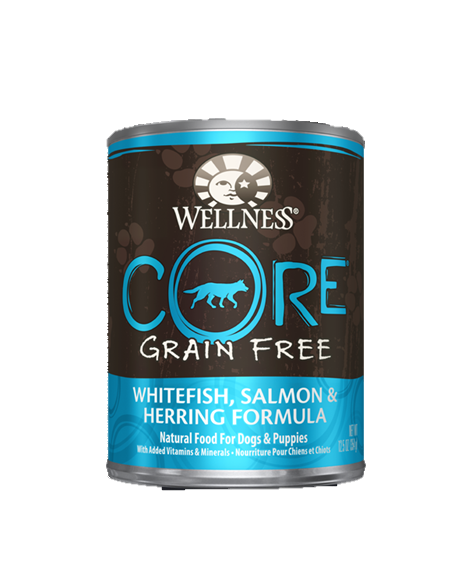 › Wellness® CORE® is based on the nutritional philosophy that pets, based on their primal ancestry, thrive on a diet mainly comprised of meat. Each formula is packed with a high concentration of quality animal protein, without fillers or grains, along with a proprietary blend of botanicals and nutritional supplements. ›This unique, grain-free recipe supports and nurtures your pet’s inside…their essence…their core. › To create a protein-focused diet the Wellness Way, we carefully control the quality and quantity of the ingredients we use, and pay close attention to the individual properties of each inclusion. From source to bowl, we make no exceptions! 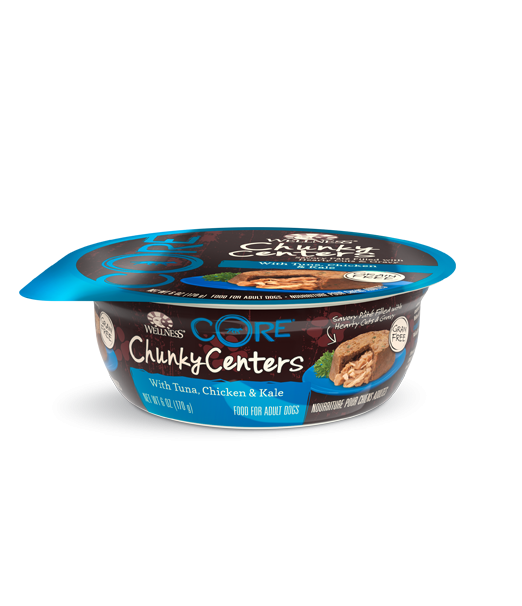 › If you are looking for a food with more meat and no grains, CORE is truly a more thoughtful alternative. This diet delivers the meat content you’re looking for, while creating a balanced profile of high quality, natural ingredients appropriate for everyday feeding. › Supporting your pet’s inner wellbeing. › In a word… balance. Unlike many grain-free diets, we’ve considered your pet’s whole health by ensuring the overall nutritional equation remains appropriate for everyday feeding. Higher protein can also mean higher fat, minerals and calories. By thoughtfully selecting specialized ingredients and managing nutritional ratios, CORE delivers protein-focused nutrition thoughtfully – with balance, not excess. › This is grain-free nutrition the Wellness Way® – thoughtfully-balanced, nutrient-dense and created from the highest quality, cutting-edge natural ingredients. A diet so unique you can see it in your pet’s weight, coat, digestion and overall radiance. 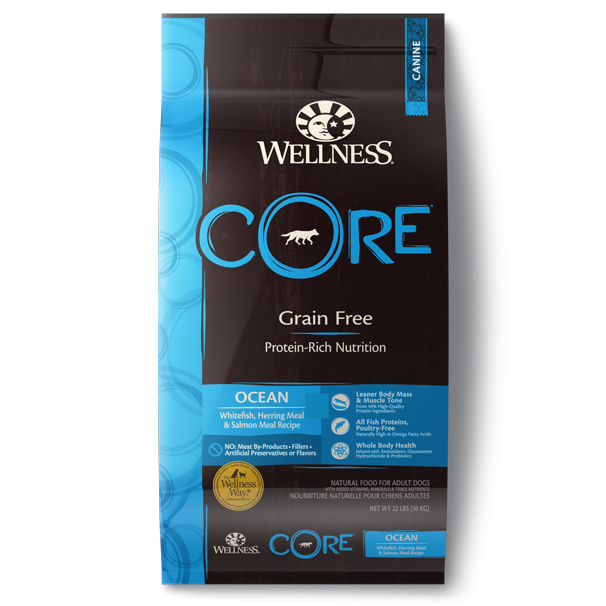 Unlock your pet’s core health with Wellness CORE. › We are proud to offer this choice in the Wellness line of natural food for pets. This diet supports our continued belief that thoughtfully balanced natural nutrition is the foundation of wellbeing, happiness and longevity we want for all of our family members, including our animals. Chicken broth, water sufficient for processing, tuna, chicken, salmon, kale, potato starch, chicken liver, egg, natural flavor, locust bean gum, carrageenan, tricalcium phosphate, potassium chloride, sodium carbonate, salt, xanthan gum, guar gum, magnesium sulfate, vitamins [vitamin e supplement, thiamine hydrochloride, niacin, vitamin a supplement, pyridoxine hydrochloride, d-calcium pantothenate, riboflavin supplement, folic acid, vitamin d3 supplement, biotin, vitamin b12 supplement], choline chloride, zinc amino acid chelate, iron amino acid chelate, manganese amino acid chelate, copper amino acid chelate, potassium iodide, sodium selenite. Wellness® CORE chunky centers with Tuna, Chicken, & Kale is formulated to meet the nutritional levels established by the AAFCO Dog Food Nutrient Profiles for maintenance. Feeding Information: Best at room temperature. Refrigerate unused portion. Adjust feeding as needed. Always provide water. When fed alone to adults: 1 container per 4 lbs of body weight per day. When fed with wellness dry: reduce dry by 1/3 cup for every 1 container. Calorie Content: This food contains 860 kcal per kilogram or 146 kcal per cup ME (metabolizable energy) on an as fed basis (calculated). This food is formulated for adult, non-reproducing dogs over one year old as puppies and pregnant or nursing mothers have special nutritional requirements. It is important to slowly transition your dog from his/her current diet as it takes a few days for the body to adapt to new nutrient levels. To transition, gradually mix in the new food over a 5-7 day period, increasing the amount of Wellness® each day, so that you are feeding 100% Wellness® CORE® by day 7. CORE is highly palatable so your dog may tend to eat more of this food. Watch initially to see if you need to adjust regular eating patterns. Give your dog access to clean, cool fresh water at all times and feed Wellness® CORE® wet food in combination whenever possible, to increase the level of water in your dog’s diet. Nutrition is the foundation of wellbeing, but be sure to give your dog plenty of love, exercise and see your veterinarian regularly!